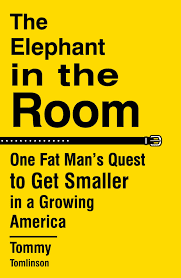 The Elephant in the Room by Tommy Tomlinson was a an excellent memoir subtitled One Fat Man's Quest to Get Smaller in a Growing America. Tomlinson is someone whose writing I first posted on back in 2011 and in this book he gives a profound look at his life. It's an entertaining read about struggling with his weight, but also much more than that, with the lyrical writing and content about his life and career reminiscent of one of my favorite books, The Tender Bar by J.R. Moehringer. Tomlinson covers well so much ground: the love provided by his parents, the South he grew up working poor in, the food of the region and what it meant to him, the pain of losing his sister Brenda, his wife Alix and the dog Fred they loved, as well as doing work for a living that thrills him, and with people he built powerful bonds with. Specifically about his writing, Tomlinson covers time spent working on a newspaper and with writing friends Kevin Van Valkenburg, Chris Jones, Joe Posnanski, and Michael Schur, spending a year as a Nieman Fellow at Harvard, and as he notes, trying to write big stories about little moments. The stories told are rich and profound, including getting throat cancer at 29 years-old and how Tomlinson would save his last fast food receipt, just in case that would wind up being his last and he would stay forevermore away from the temptation. Additionally, the book struck me as very much having a sort of duality to it (which I love coming across in writing), with it an elegy of things lost and that he wasn't able to do and also a celebration of what he has and aspires to in what seems a great life, with the writing on it inspiring emotions ranging from entertained to sympathetic to jealous and to inspired. The Culture Code by Daniel Coyle was a really good book with the subtitle The Secret of Highly Successful Groups and in it, Coyle provides examples of successful organizations including: the San Antonio Spurs, Pixar, IDEO, Upright Citizens Brigade, Zappos, Johnson & Johnson, KIPP schools, and SEAL Team Six. 1. Build safety - how signals of connection generate bonds of belonging and identity. Coyle writes of this as the glue area for successful groups, with having people feel safe within a group by: asking questions of them (preferably in close proximity), actively listening to the answers, showing small courtesies, and thanking people. Related to these activities are the signaling of strong belonging cues in the areas of (A) energy - investing in the exchange, (B) individualization - treating someone as unique and valued, and (C) being future oriented - letting them know the relationship will continue and move forward. 2. Share vulnerability - how habits of mutual risk drive trusting cooperation. This skill is noted as the muscle area and all about togetherness and working as a group. The important thing isn't what roles people hold as everyone in it together, and the leader in particular needs to be vulnerable first and open... with a focus on listening, caring, and being open along with direct. 3. Establish purpose - how narratives create shared goals and values. The third skill is described as being a focus on what it's all working towards, with plenty around mission statements and also noted towards the end of the book are the importance of both rehearsals prior to something and active group reflection after. Also covered are the ideas of naming and ranking priorities, employing catchphrases for things of import, and overall working to set teams up for success.